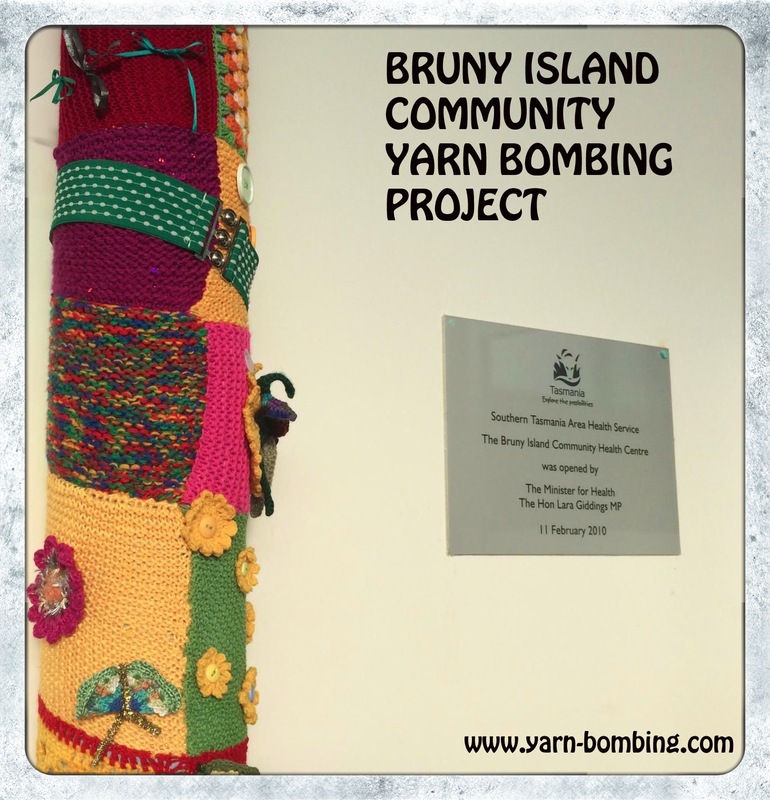 This weeks blog post is a follow up on a community yarn bombing project that I have been following on Bruny Island Tasmania. 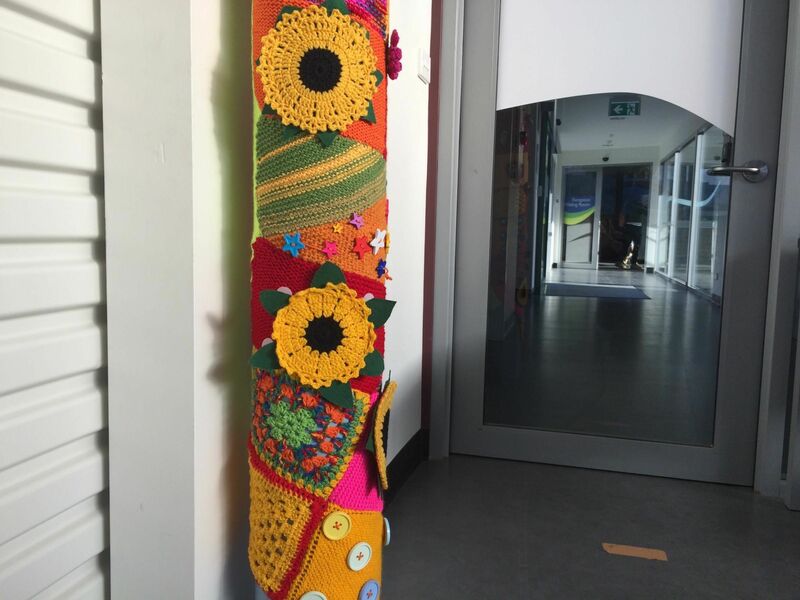 These colourful knitted and crocheted, yarn bombs where produced by a group of highly talented crafters, who are part of an elderly citizens respite group called BIRCH. 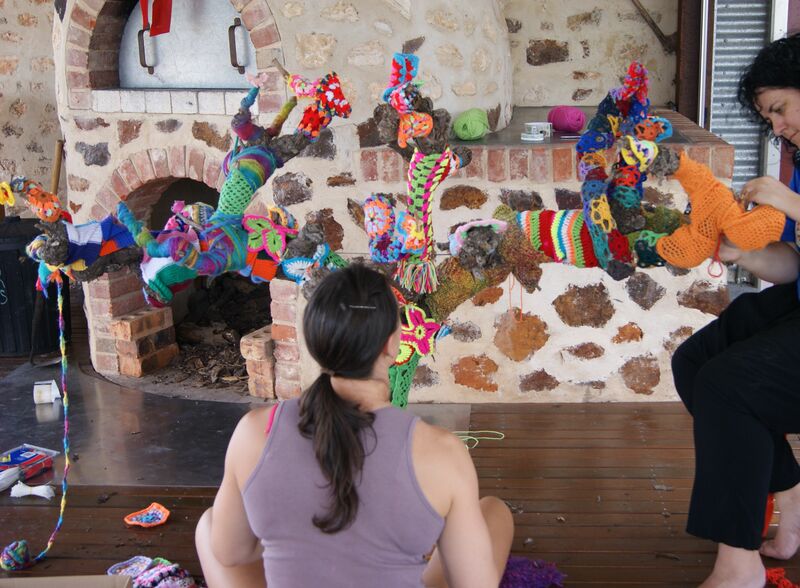 This talented group have been yarn bombing the Jane Finn community room at the Alonnah Health Centre on Bruny Island, an Island in the Southern Ocean, off the coast of Southern Tasmania in Australia. 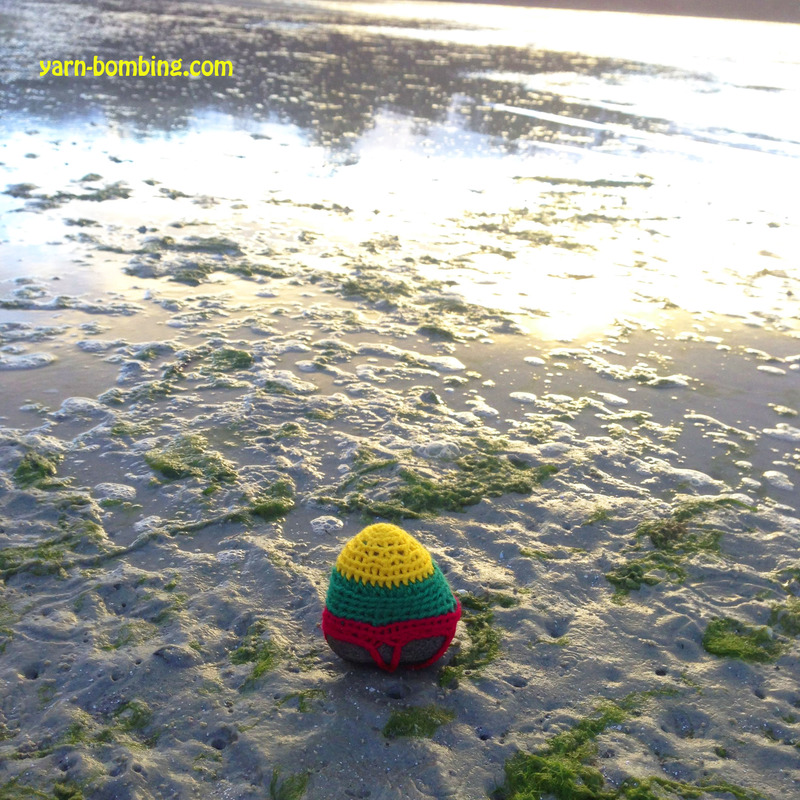 This entry was posted in Uncategorized and tagged AUSTRALIA, Bruny Island, craft, crochet, knitting, photography, Tasmania, yarn bomb, yarn bombed, yarn bombers, yarn bombing on October 4, 2015 by yarnbomb. 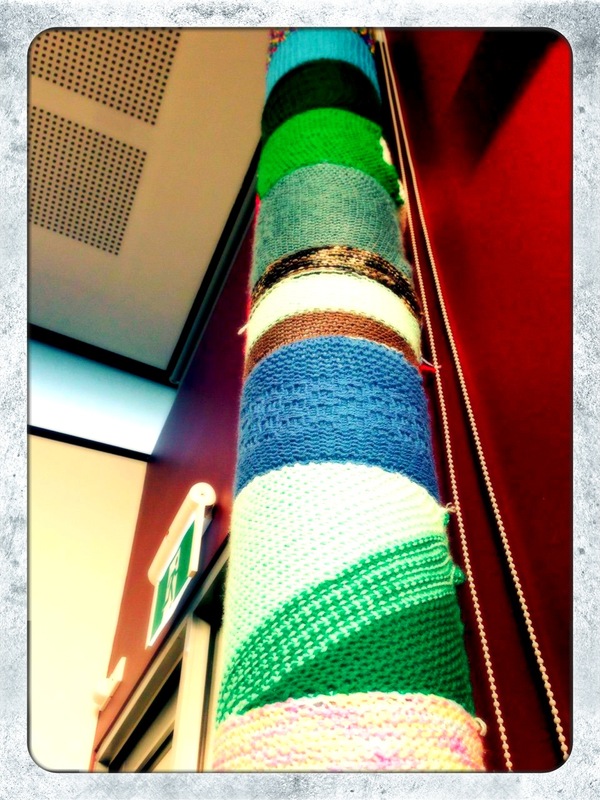 The ladies from Bruny Island Respite House BIRCH have been doing some great yarn bombing in the Jane Finn room at the Bruny Island Health Centre in Alonnah on Bruny Island, Tasmania. 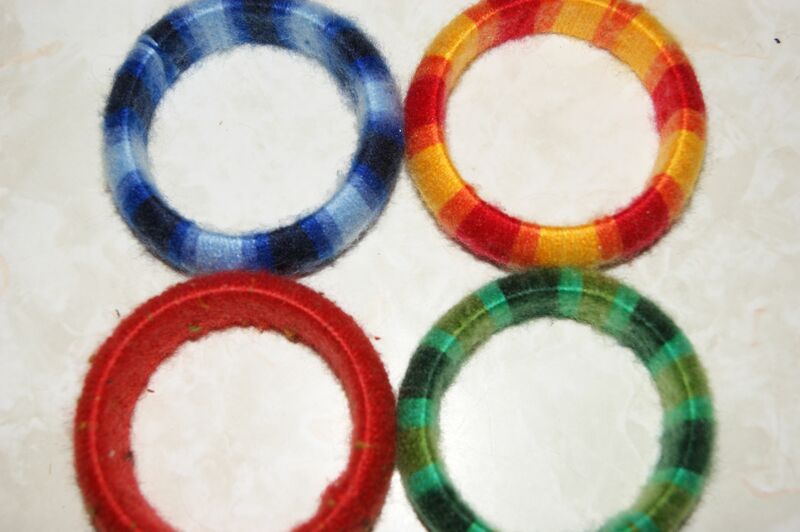 I slipped in on my day off and snapped some photographs. The ladies at the reception where very accommodating when I asked to take a peek. 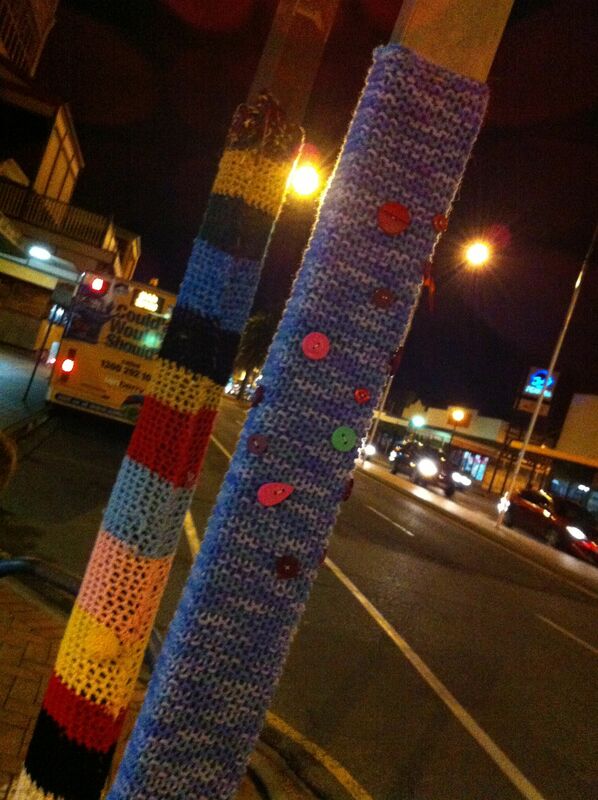 What a great community project done by some great elderly citizens. 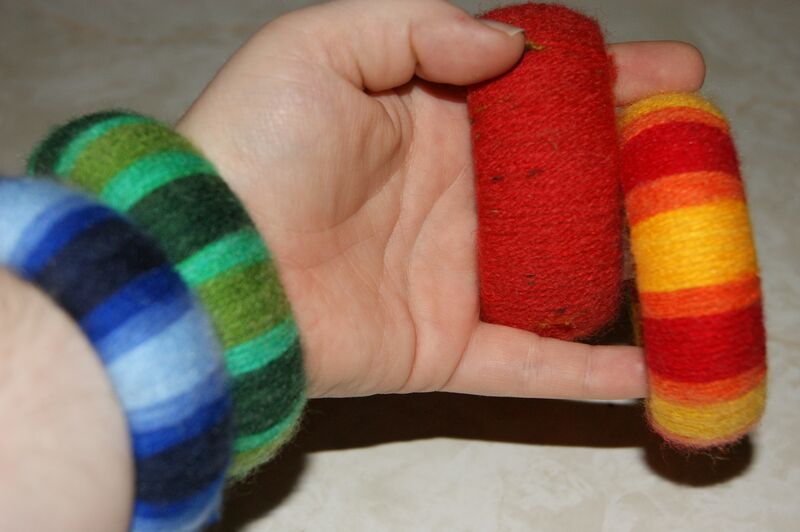 What wonderful projects people can undertake when they get together over a cup of tea and a biscuit. 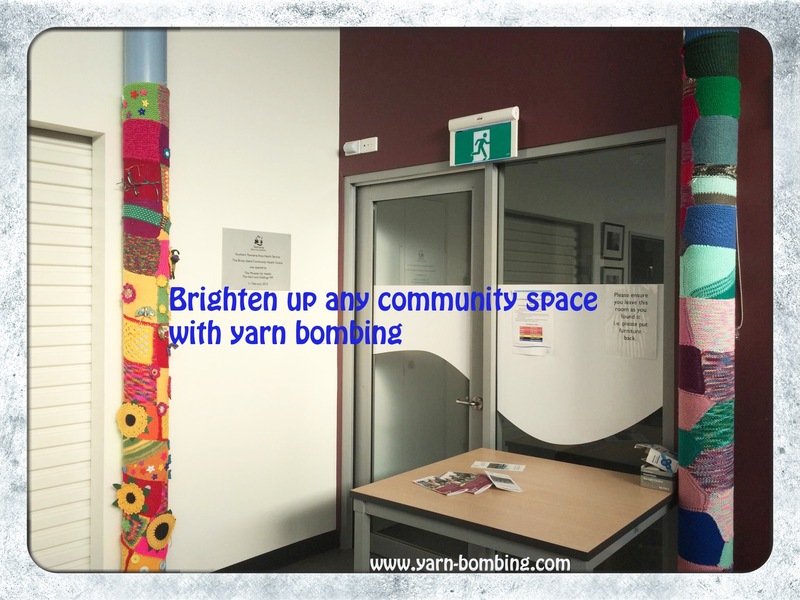 The ladies have been knitting and crocheting up a storm & I will be keeping track of their efforts so watch this space for more photographs soon. 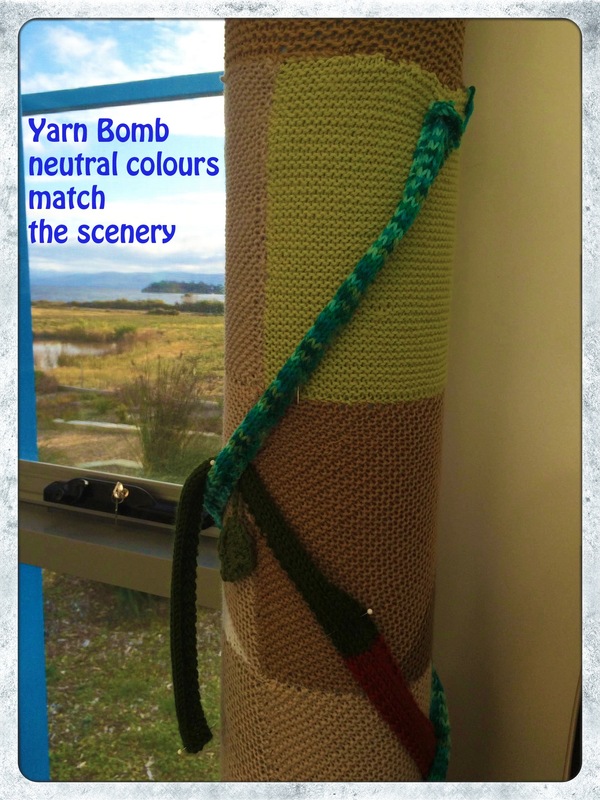 This entry was posted in Uncategorized and tagged Bruny Island, community, craft, crochet, knitted, knitting, Tasmania, yarn bomb, yarn bombers, yarn bombing on September 30, 2015 by yarnbomb. 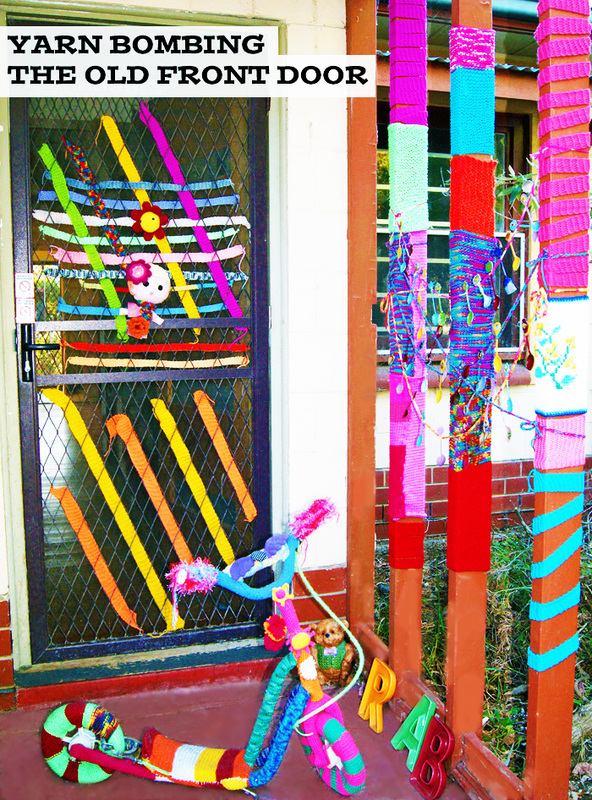 I got a bit crazy with the knitting needles & the junk pile & the front door, last year. 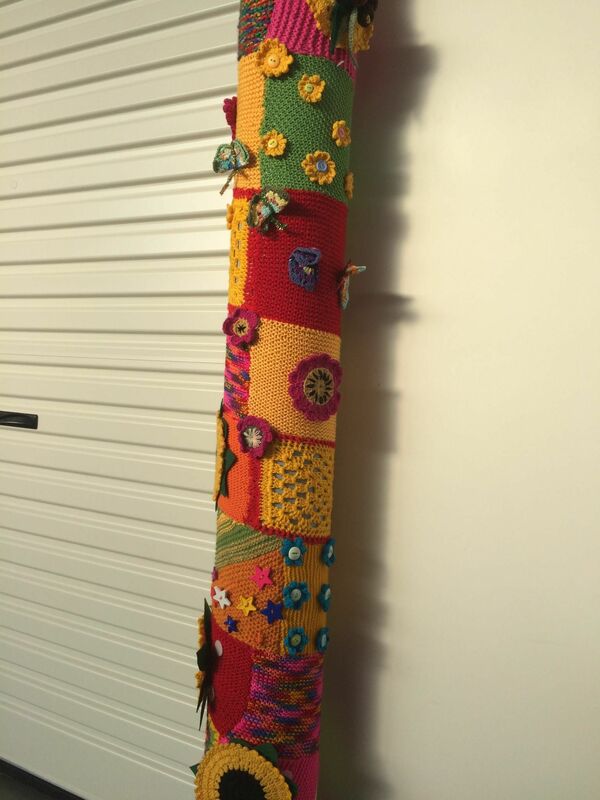 Not only did I yarn bomb everything in sight but I also made a kind of garland out of old novelty spoons, seen tied to the yarn bombed posts. 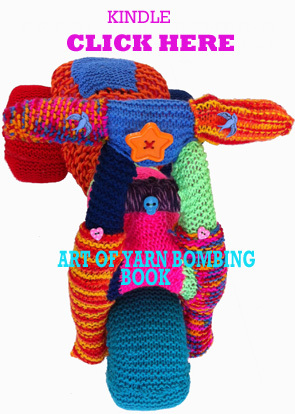 I love junk, yarn, crochet, craft & knitting. This entry was posted in crochet, knitting, Yarn bombing and tagged craft, crochet, knitting, photography, yarn bomb, YARN BOMB SCOOTER, yarn bombed bike, yarn bombing on January 22, 2015 by yarnbomb. 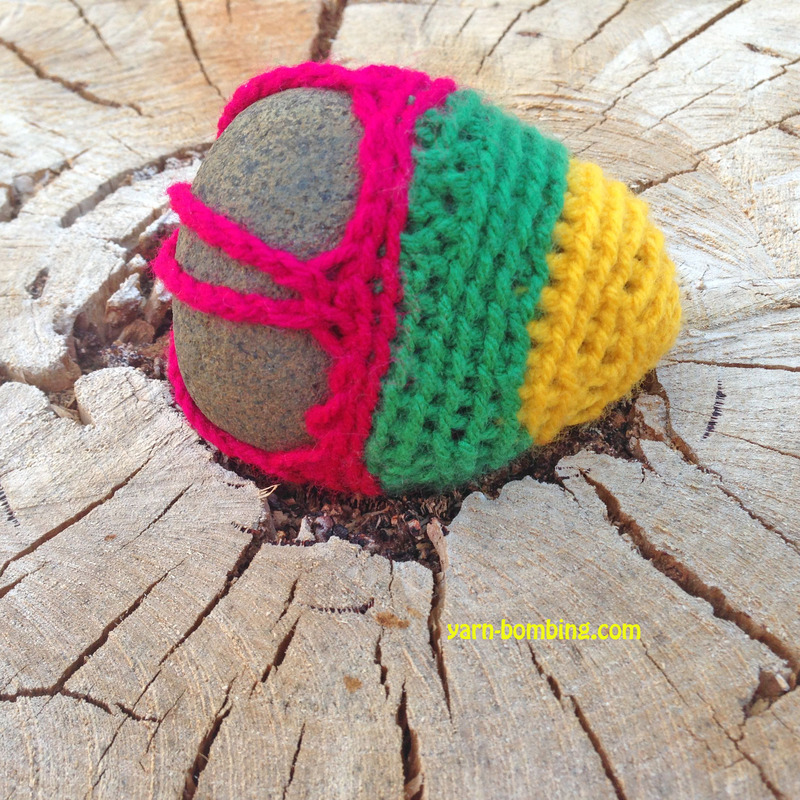 I found this rock on the beach & yarn bombed it with multi coloured crochet. 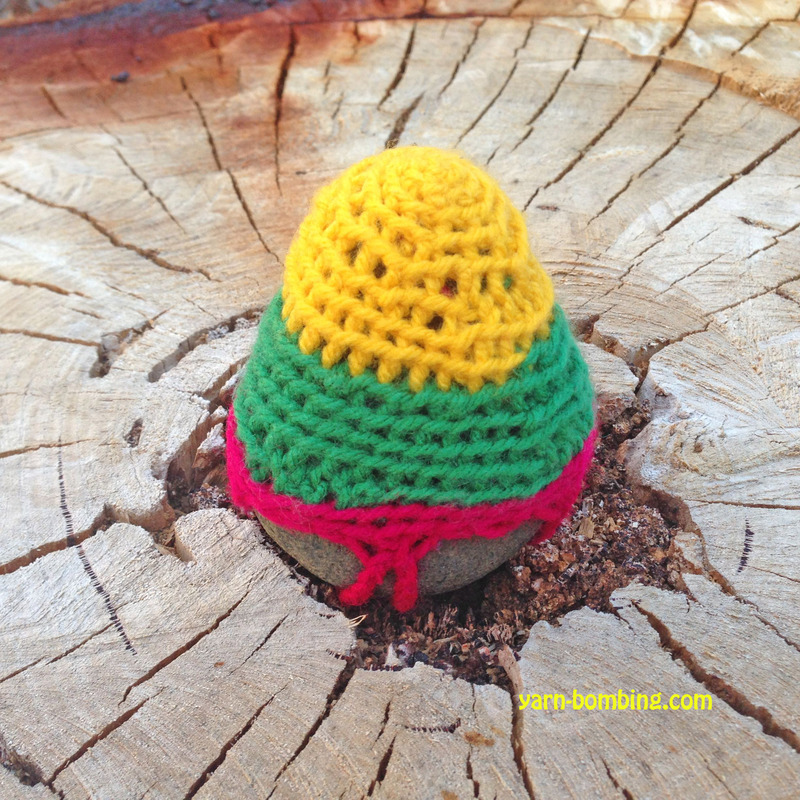 I crocheted around the rock ( no pattern ) until it fit snugly like a little woolly skin. 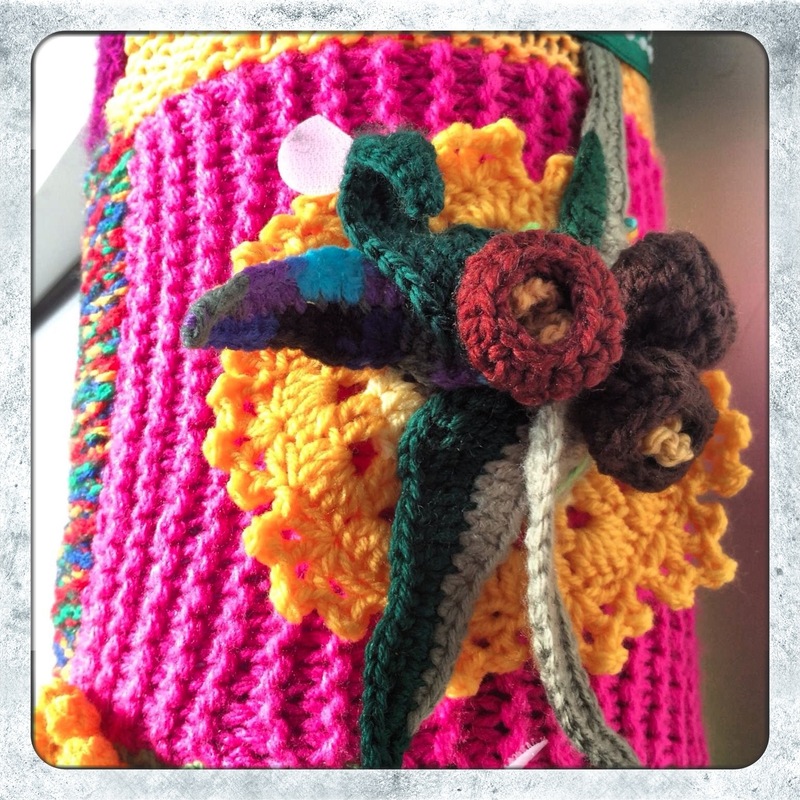 This entry was posted in crochet, photography, Yarn bombing and tagged beach, crochet, photography, yarn bomb, yarn bomb rock, yarn bombing on January 12, 2015 by yarnbomb. 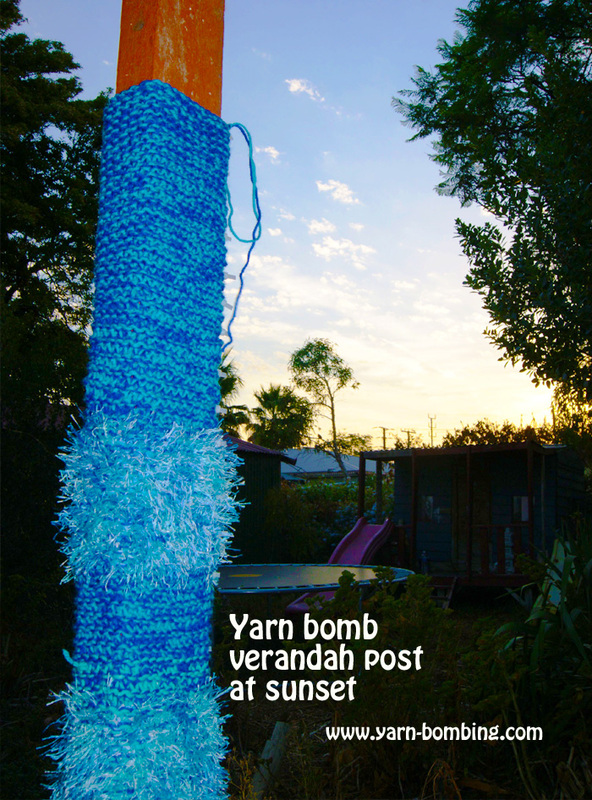 This entry was posted in crochet, photography, Yarn bombing and tagged craft, crochet, knitting, photography, yarn, yarn bomb, yarn bombing on November 3, 2014 by yarnbomb. 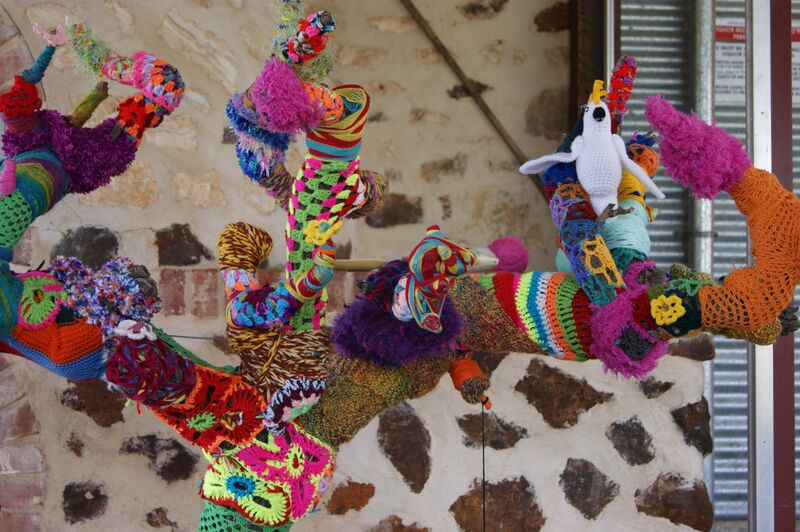 I was lucky enough to be part of the YARN BOMBING WINE project at Taranga Winery in South Australia. 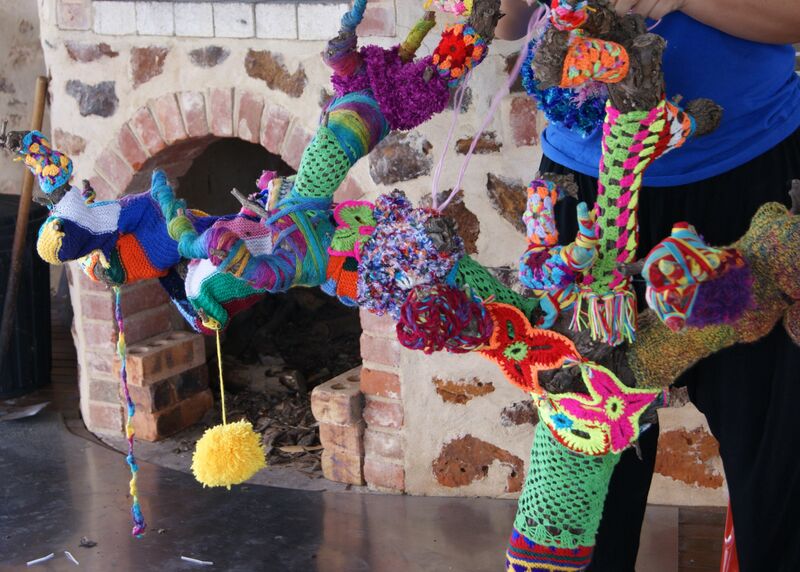 We yarn bombed an old and gnarled grape vine, which was subsequently photographed and used as the cover art on a wine label. 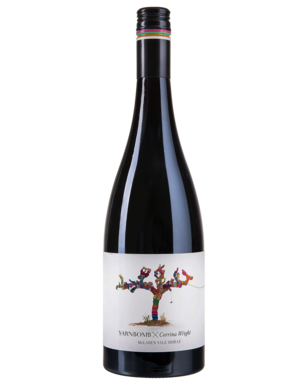 The Wine is a 2012 South Australian Shiraz. 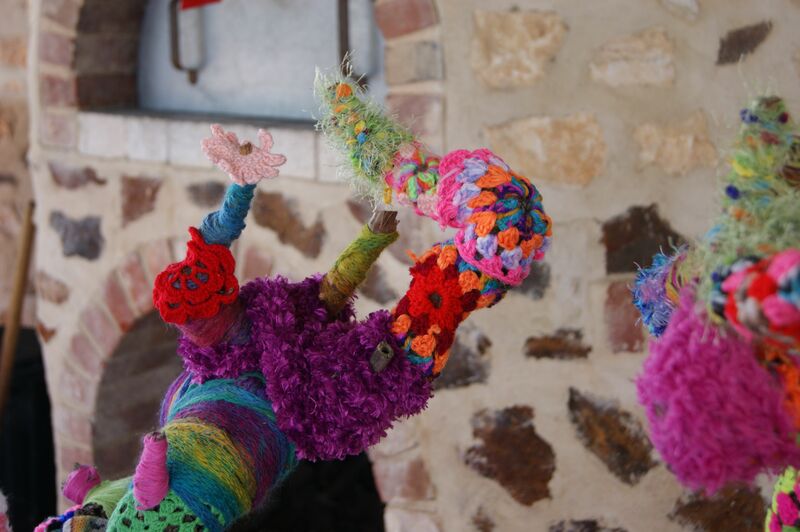 See the website for Yarn Bomb Wine This wine was produced by Corrina Wright at Tarranga Winery South Australia. 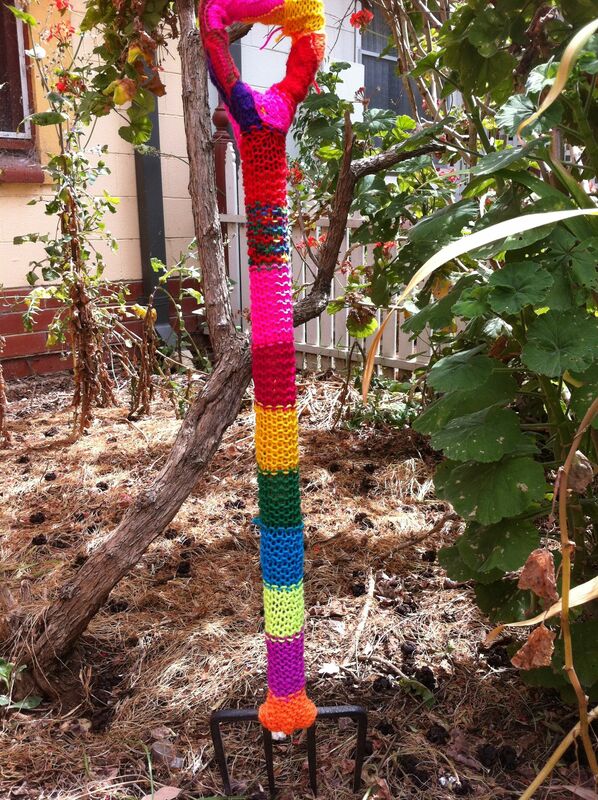 Special mention goes to Sarah-Jane Cooke for working with me on yarn bombing the vine. 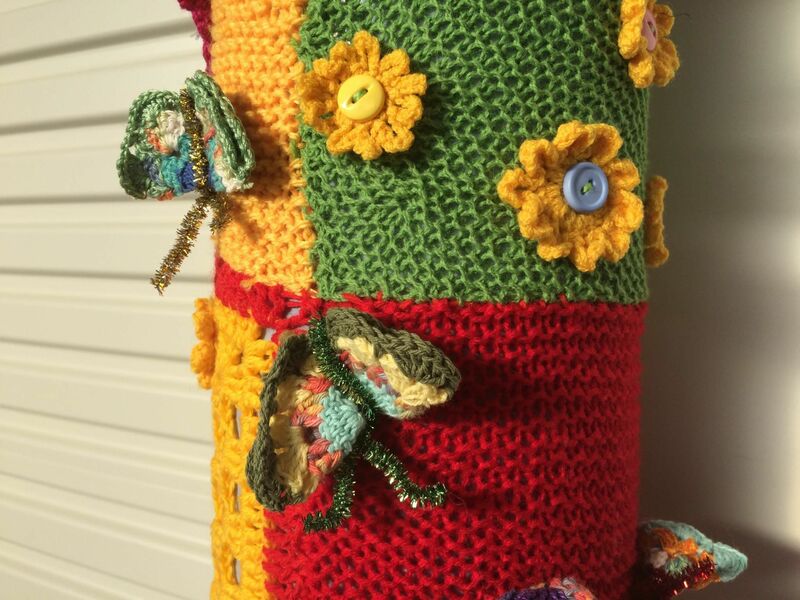 This entry was posted in cross stitch, knitting, photography, Yarn bombing and tagged crochet, knitting, photography, south australia, wine, Winery, yarn bomb, yarn bombing on October 22, 2014 by yarnbomb. 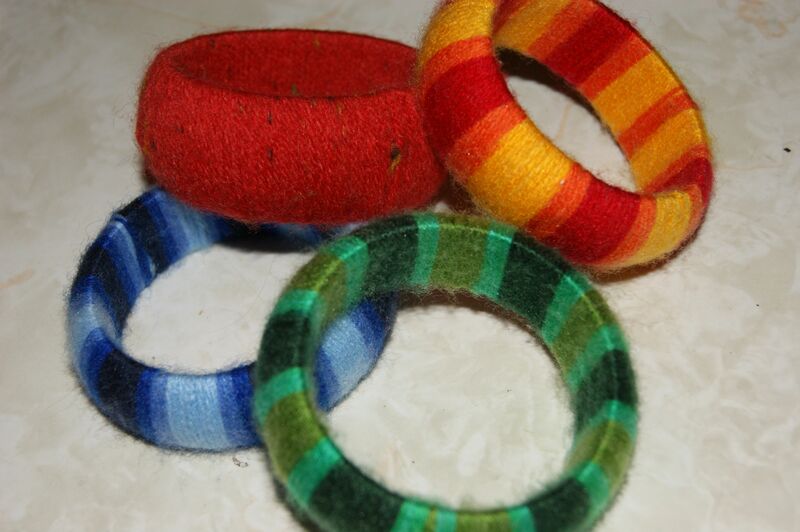 JAZZ UP YOUR OLD BANGLES BY WRAPPING THEM IN YARN. 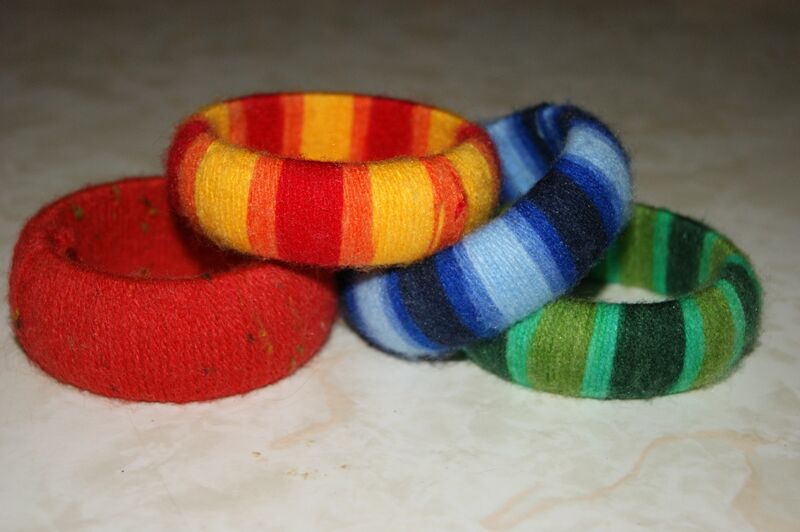 I USED WOODEN BANGLES TO MAKE THESE. 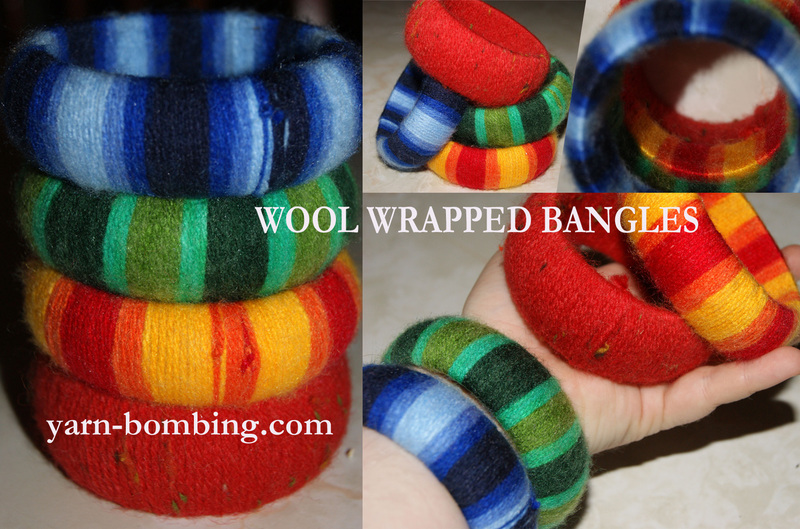 THE STRIPED BANGLES ARE MADE WITH A SINGLE BALL EACH OF MULTICOLOURED YARN, THE YARN FORMS GREAT STRIPES AS YOU WRAP IT. This entry was posted in crochet, knitting, photography, Yarn bombing and tagged Bangles, bracelets, craft, crochet, Gifts, knitting, yarn, yarn bombing on September 21, 2014 by yarnbomb.